The Voice is an American reality TV show, where participants sing in a competition to win $100,000 and a record package with Universal Music Group. The coaches are well know musicians and support the participants realize their total potential. Coaches have consisted of Adam Levine (lead singer of Maroon 5), Blake Shelton, Cee Lo Green, Christina Aguilera, Shakira, and Usher. The Voice started airing on April 26, 2011 as a spring TV season program. The show affirmed to be a hit for NBC and was subsequently widened into the fall cycle when the third season premiered on September 10, 2012. The series employs a panel of four judges who critique the contestants’ performances. 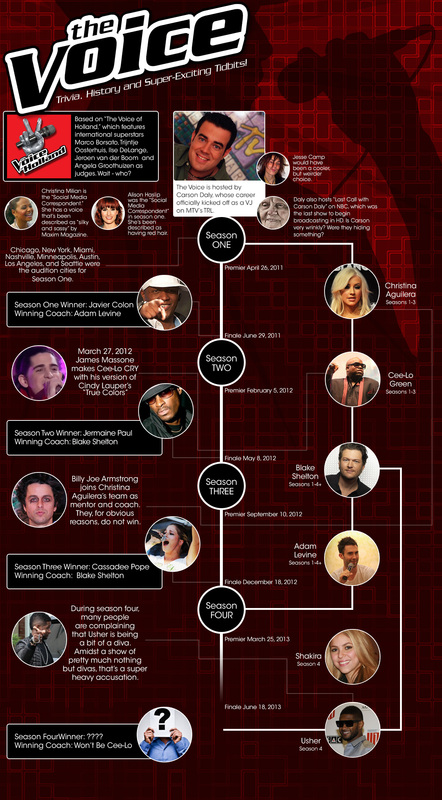 Learn more trivia and history about The Voice in the following infographic.